Figure 5.1 Four different ultrasound classifications of miscarriage: (a) early fetal demise (formally missed miscarriage); (b) early embryonic demise (formally blighted ovum or anembryonic pregnancy); (c) incomplete miscarriage; (d) 'complete miscarriage' should now be included under the umbrella term 'pregnancy of unknown location'. 1. 'Intra-uterine fetal demise', also called 'missed miscarriage' (Figure 5.1a). 2. 'Embryonic demise', also called 'blighted ovum', characterized by an empty gestational sac (Figure 5.1b), or 'anembryonic pregnancy'. 3. 'Complex mass', characterized by areas of different echogenicity caused by bleeding in the gestational sac (Figure 5.1c). This is known as an incomplete miscarriage. 4. 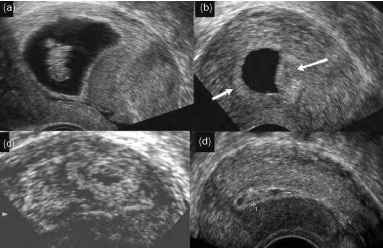 Finally 'complete miscarriage' (Figure 5.1d), where an empty uterine cavity is noted or where there is only a minimal, non-significant amount of retained products with an antero-posterior diameter less than 15 mm in the longitudinal view of the uterus. The antero-posterior diameter is measured in between the myometrium and endometrium border as shown in Figure 5.1b. The term should now be included under the umbrella term 'pregnancy of unknown location'. 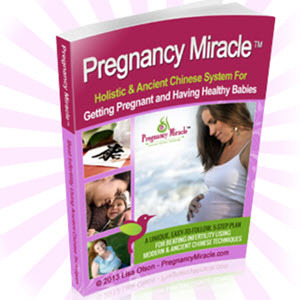 How to know if my miscarriage is complete?